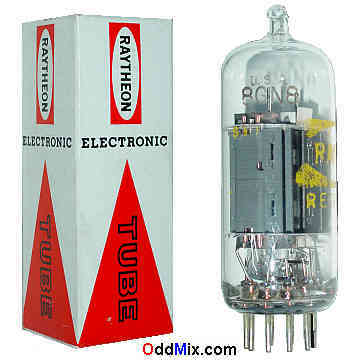 This is an original Raytheon 8EB8/8GN8 High-Mu Triode, Sharp-Cutoff Pentode electronic vacuum tube. This tube is useable for replacement part in VHF television and FM receivers. Substitute - with filament voltage change - 6AB8 and EU16. A High-Mu triode can be used for many other special purpose circuits like oscillators and RF amplifiers. Excellent for antique radio or television restoration projects, circuit reseach, experimentation, audio amplifiers, for a single tube regulated, adjustable laboratory power supply or to set up a private vacuum tube museum. It is a NOS tube - New Old Stock, unused, boxed condition. • Heater: 8 V, 0.6 A • Substitute 6AB8, EU16 - Fil V!